"...Public Services – AGRICULTURE & COOPERATION DEPARTMENT- Recruitment – Filling up of Seven hundred and fifty three (753) vacant posts of Agriculture Extension Officer Grade-II through Direct Recruitment – Permission to the Telangana State Public Service Commission – Orders –Issued. AGRICULTURE & COOPERATION DEPARTMENT - Creation of (526) Agriculture Extension Officer Grade-II posts in Agriculture Department - Orders - Issued....."
Public Services – AGRICULTURE & COOPERATION DEPARTMENT- Recruitment – Filling up of Seven hundred and fifty three (753) vacant posts of Agriculture Extension Officer Grade-II through Direct Recruitment – Permission to the Telangana State Public Service Commission – Orders –Issued. 1. G.O.Ms.No.113, Finance (HRM-I) Department, Dt:03.07.2017. ORDER: In the reference second read above, the Agriculture & Cooperation Department have furnished proposals for filling up of (753) vacancies in the category of Agriculture Extension Officer Grade-II by direct recruitment through the Telangana State Public Service Commission, Hyderabad. 2. After careful examination of the proposals furnished by the Department and keeping in view the actual requirement of manpower with reference to the nature of work and activities of the department and also the overall financial implications, Government hereby accord permission to fill (753) Seven hundred and fifty three vacancies in the category of Agriculture Extension Officer Grade- II through direct recruitment by Telangana State Public Service Commission. AGRICULTURE & COOPERATION DEPARTMENT - Creation of (526) Agriculture Extension Officer Grade-II posts in Agriculture Department - Orders - Issued. Read the following: 1. A&C Department, U.O.No.2501/Agri.I(1)/2017, dt:16.06.2017. ORDER: In the reference 1st read above, the Agriculture & Cooperation Department have requested for creation of (526) posts of Agriculture Extension Officer Grade-II in Agriculture Department@ one Agriculture Extension Officer for every 2000 hectares (i.e., 5000 acres) cultivable land for having an effective network of grass-roots technical field staff in Telangana State. 2. Government after careful examination of the proposal, hereby accord sanction for creation of (526) posts of Agriculture Extension Officer Grade-II in the pay scale of Rs.22460-66330 in Agriculture Department. 3. The Agriculture & Cooperation Department shall obtain concurrence of Finance (HRM) Department before initiating measures to fill up the posts sanctioned in this order, wherever service rules prescribe direct recruitment. 4. The Agriculture & Cooperation Department shall take necessary action accordingly. 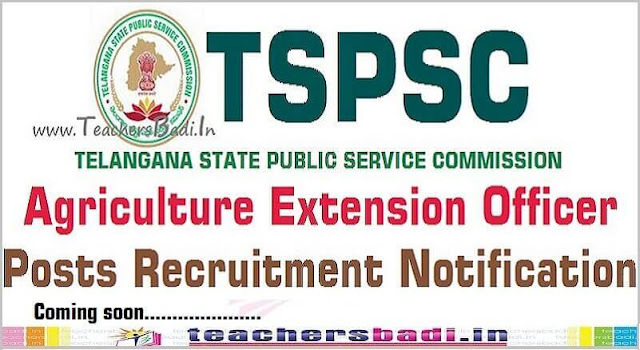 ORDER: In the reference second read above, the Agriculture & Cooperation Department have furnished proposals for filling (98) vacancies in the category of Agriculture Extension Officer Grade-II by direct recruitment through the Telangana State Public Service Commission, Hyderabad.